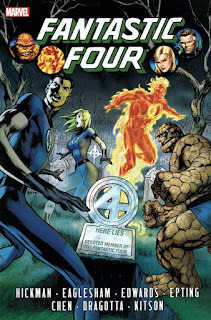 About a year ago, I noted that since the Fantastic Four had been cancelled, it would relatively easy to get caught up on the title. With issue #555, I stopped reading after about 25 years, having grown tired of the (in my estimation) very poor portrayals of the characters and the seemingly unending crossovers. So I spent a year and a half or so hitting the bargain bins. Not long ago, I finished picking up a copy of every issue that I had missed, including the spin-off titles. Most of which I paid about one third of the original cover price for. Now, a few years earlier, I had been gifted a trade paperback of the middle of Hickman's run and, while I liked the basic characterizations, found that the stories were very dense with then-current continuity. So even as a FF fan going back a quarter century, I was at a bit of a loss on multiple occasions. But now I had the opportunity to read everything Hickman did in order. I also basically did it in one sitting too. So what did I think? Well, I have to say that I liked it a lot better than the short snippet I had read previously would suggest. The three main problems I had with that trade were 1) the dense continuity that doesn't make much sense to an outsider, 2) the lack of attention given to the Invisible Woman, and 3) the lack of focus showcasing the FF as a family as they're adventuring. With the broader context of the rest of Hickman's run, those issues were largely addressed. The continuity concerns were largely relative and exclusive to Hickman's work, and all of the concepts and ideas were introduced in earlier issues. Susan does get some good spotlight pieces in other stories, as does the FF's functioning as a family. I also liked that Hickman did not have any major line-wide crossovers to deal with. This was pretty much exclusively his story, and he didn't have to shoehorn in some Avengers plot or anything. But there are still nods to the outside Marvel Universe (obviously, with Spider-Man joining the team for a while, and some Avengers cameos) so it doesn't feel as if the FF were working in isolation. That's an especially good thing, given how dense Hickman's overall run is. I found the storytelling enjoyable overall. Hickman was clearly playing a long game here, letting plots slowly percolate in the background for a number of issues before coming to a head. And many of the stories that might have seemed as one-offs at the time wound up tying back into a larger story by the end of his run. What was impressive was the size and scope of what he did. There were clearly too many stories for one title, and the first ongoing spin-off title (simply called FF) was indeed necessary just to tell all the stories he was trying to get in. Honestly, a third title might have been useful too. That he crammed in as much as he did into his 60-ish issues is no small feat. That it still made sense at all deserves kudos. If there is a problem with Hickman's run, it's that I don't think it can be really separated. You almost have to read the whole thing (both titles) from beginning to end. Marvel did smartly collect everything, but it still required TWO omnibus packages. I think that's a lot to ask of readers, particularly when the real payoff is only after having gotten through to the last issue or two. I wonder if Marvel's apparent pettiness with Fox Studios, who currently has the movie rights to the characters, worked in Hickman's favor here? After all, with Marvel downplaying the title (and now cancelling it entirely) to theoretically hinder the movie's potential success, Hickman may have been given a creative freedom to write this extended narrative. He didn't have to tie in to any huge marketing campaigns or add story elements/characters for the sake of making recognizable the characters movie audiences might be familiar with. I'll admit that going back to sort through these issues was a bit of a slog. The original title ran up until #588, then switched over to FF for eleven issues before restarting Fantastic Four at #600 while still alternating with the FF for another year. Plus there was a weird #605.1 wedged between #605 and #606. While it probably made more sense if you were keeping up at the time, sorting through back issue bins for this was kind of a pain. The remaining numbering looks to be a bit of a mess too. I don't envy any libraries trying to catalog all this! But, like I said, once I sorted through all the barriers that were preventing me from starting this run, I did find the overall read quite enjoyable and it's good to know that something akin to my version of the FF was still out there at least as late as 2012. You might also want to check out Hickman's Avengers run and Secret War storyline. They work like a continuation and a climax of what started in his FF run. An enjoyable post. I think I've read two or three TPB's from this run. I especially like some of the covers by Alan Davis. I think Hickman laid a nice groundwork for Matt Fraction in both FF and Fantastic Four. I'd be interested to hear your thoughts on that take on the fab four and their extended family? I read Fraction's FF for the entire run (picking up back issues after joining midway through) initially only for Mike Allred's Kirby-esque artwork. The writing was of a very high quality too, combining a Silver Age sensibility with a post-modern humour. I must confess, I only managed to stay with Allred for about seven issues of his current Silver Surfer run with Dan Slott - visually magnificent but thin on story. I forget the podcast, but Hickman said the freedom came as a result of the Millar/Hitch FF reverting to normal sales after the first few issues. Marvel figured if those two creators could not sell the book after The Ultimates, it did not matter who was doing FF. JMS/McKone also did not increase sales outside of Civil War. Waid has cited that while sales improved somewhat after his and Wieringo's first issue that was priced at $.09, the increase was not enough to satisfy Bill Jemas. By the time Hickman came on, what did Marvel have to lose? I enjoyed Hickman's run until he started using the word 'retard' in his version of Valaria. Made me sick then and makes me sick now.